The Lake Almanor Watershed Group (LAWG), formerly known as the Almanor Basin Watershed Group (ABWAC), was created in 2005 by the Plumas County Board of Supervisors to address water quality, land use, and critical habitat issues in the Lake Almanor Basin and make policy recommendations to the Board of Supervisors. From 2005 to 2013, ABWAC served as an official advisory body to the Plumas County Board of Supervisors. The eleven volunteer ABWAC members worked closely with existing organizations, and provided recommendations to the county on a range of topics from overnight boat use on Lake Almanor to cloud-seeding. ABWAC created a Watershed Management Plan that was approved by the Plumas County Board of Supervisors in 2009 and is intended to guide all efforts by the ABWAC to protect water quality, critical habitat and quality of life in the Lake Almanor basin. Since 2009, ABWAC (now LAWG) raises money each year to hire an independent contractor to sample the lake. In September of 2013, the group decided to end their official relationship as an advisory body to the Plumas County Board of Supervisors. The group continues to pursue its mission to maintain and improve the health the Lake Almanor watershed. Sierra Institute has been a part of LAWG since its origins in the early 2000's and provides watershed coordination for the group. 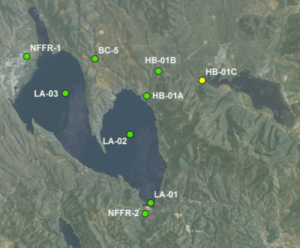 The Lake Almanor Watershed Group (LAWG) conducts annual water quality monitoring of Lake Almanor and its tributaries. Performed in conjunction with the California Department of Water Resources, samples are collected and analyzed to explore important water quality parameters like dissolved oxygen, water temperature, nutrient content, and algal concentration, as well as certain important metals. Each year, LAWG hires an independent contractor, Dr. Gina Johnston from CSU Chico, to analyze these results and compile them into an annual report on the health of Lake Almanor. Annual Water Quality Reports can be viewed and downloaded from the Resources tab below. The Almanor Basin Water Trails Map is a “non-profit” map, designed to promote low-impact recreation in the area and boost local economic opportunities. This is a project of the Mountain Meadows Conservancy. More information on the map can be found at almanortrails.org. The full 2018 Report is Available. Note also the tables of Physical Data available. Join us at any meeting! Meetings are open to the public and are held the Second Wednesday of every other month unless noted otherwise. June 25, 2018 - "Boat Owners, Check for Mussels"
June 6, 2018 - "Lake Almanor Group Tackles Host of Issues"
June 14, 2017 - "Unique Water Trails Map Now Available"